The only Who novel this year to feature Nardole as well as Bill, here we are in Edinburgh in 1645, with plague stalking the streets, the dead not staying dead, and horrors lurking in the night, while the authorities (led by the provost, the historical Sir John Smith) are deeply suspicious of strangers in strange clothes. 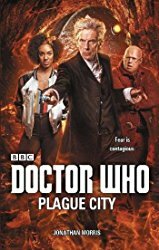 The claustrophobia and horror of the plague-run capital is well conveyed, though of course the core plot concept was done very early in New Who with The Unquiet Dead. The banter between the Doctor and Nardole is caught well, and Bill also gets plenty to do. Solid stuff.